Welcome back from the holidays. We hope you had time to recharge for the next semester ahead. The Library staff would like to wish our students at ADMC the very best in the exam period, and would like to let you know that the library will extend its hours to allow you to cram a few extra hours of study in! We will confirm the dates and times soon and display them on our screens. We are also very excited as the M-Reader competition winners are announced this month. The library staff would like to congratulate ALL Foundations students for their participation in this project, and extend our thanks to the teachers who support the students. We hope that Foundations students will soon begin to experience the benefits of reading, as students who read improve in all areas of language learning at a faster rate than those who don’t. Look out for more M-Reader competition winner news in our next newsletter. 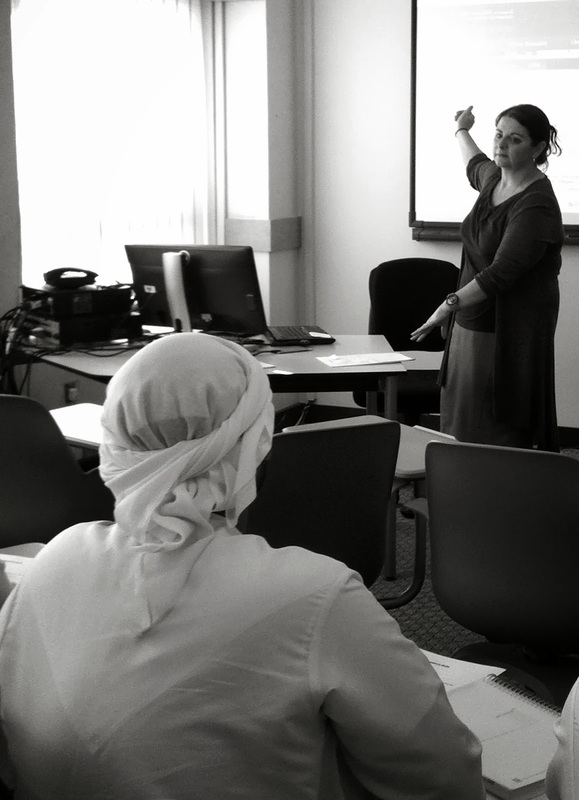 Finally, our faculty has been involved in an extensive range of Professional Development workshops. Please remember to let your liaison librarians know if you have come accross any good resources that would support you and your students in the classroom. We would love to hear from you. Please see our other Pages for suggestion on Apps for mobile devices, databases subscribed to by HCT, and websites that may be of interest to you. Welcome to the December edition of the ADMC Library newsletter! The semester break is just ahead and now is a great time to start organising your holiday reading. The ADMC Library has a great selection of graded readers that you can choose from, starting from beginners (Level 1) to advanced (Level 9). There is a wide range of genres from romance to crime. To find out what the book is about and if it interests you, read the ‘blurb’ (summary of the story) on the back of the book. We also have the Oxford Bookworms Library, online readers. Just use your HCT email and password to access the site. For staff and advanced readers, we have a selection of books on our database Overdrive Digital Library and online newspapers in Library Press Display . We have enjoyed decorating the ADMC Library for National Day. Please stop by to see our display of HCT Student authors, the UAE online quiz in the Sonic Chairs and view the heritage films that our students have made. After a successful trial, the following databases, Encyclopedia of Women& Islamic Cultures Online and Encyclopaedia of Islam Online, have been added to the Library subscriptions. You are encouraged to access and give feedback to the other databases on trial. Please see our other Pages for suggestions on Apps for mobile devices, databases subscriptions, and web sites that may be of interest to you. If you would like assistance in selecting books, online and e-book searches, please ask a Librarian. Welcome to the November 2013 edition of the ADMC Library Newsletter! If you were not aware before, we would like to remind you of our ADMC Library web site which may be found at http://admc.hct.ac.ae/student-life/library/. Find out more about our services, collections, library spaces, and opening hours. One of our many services on offer to our users is Information Literacy. IL can be performed on a one-to-one basis informally, or through scheduled presentations to classes. Students that receive Information Literacy training are far better informed, and improve their academic performance. Not only will their searches for credible information improve, but they also learn how to cite their research, and have a greater awareness of important issues like copyright and academic honesty. To organize an Information Literacy presentation for your class, please contact any of the librarians to arrange a date, time and venue. At least a week's notice is preferred. Please see our other pages for suggestions on Apps for mobile devices, databases subscribed to by HCT, and web sites that may be of interest to you. 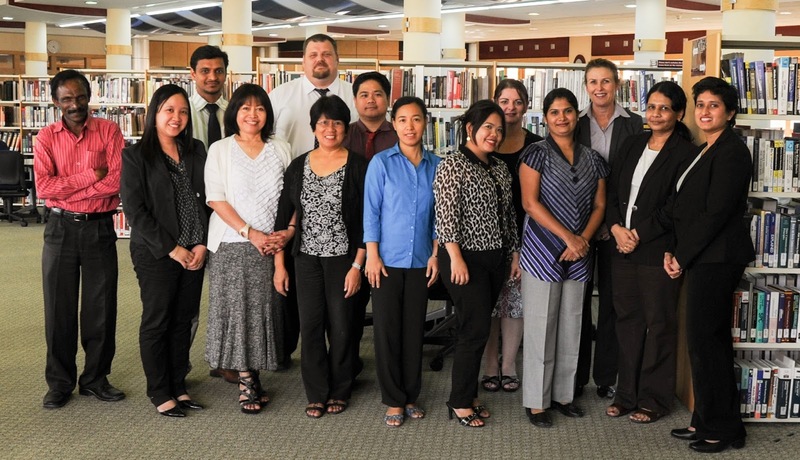 The ADMC Library & Learning Centre staff wishes all staff and students a very successful start to the year. We have had a few changes in our library too. Four new classrooms are now located at the far end of the library and our book shelves have been moved to the centre section. What a better way to get to know your library than to visit as a class, or with your friends and use the Huntzz - Treasure Hunt App? Enjoy a fun shelf-guided tour through the library at any time of the day. For more on this please see our Amazing Apps section. Our team is ready and waiting for new and returning students to join in with our Reading Programmes, Information Literacy classes and to provide any support students and faculty may need to use the wonderful variety of information available at ADMC. We hope you enjoy our first edition of the 2013/2014 Library Newsletter. In preparation for the exams, and for the further success of our students, we have extended the closing times of the Library until midnight on weekdays and Saturdays. Students now have more time to finish projects and prepare for their exams. The new library times are posted on the electronic screens, as well as on the What's New page. Board games have been donated to the Library by the Active Learning Zone (thanks Ms Elizabeth) and have been placed on top of the magazines and journals shelves. On our regular pages, we introduce an array of new digital tools and entertainment. Browse through our Wonderful Websites, Amazing Apps, Just For Fun and our Dazzling Databases page to discover interesting apps, sites and sources of information. On our Faces page we get to know a bit more about Benj Requiero. Benj not only has a passion for technology, but also for shoes... coming from the country that has a shoe museum, it makes perfect sense. Browse through the LibGuide/CampusGuide page where Danville Fourie, the Naval College Librarian, takes on the issue of plagiarism. As this is our last edition for this academic year, the staff at the Library & Learning Centre wishes all our Faculty a great summer, and to our students, a blessed Ramadan. Welcome to another exciting edition of our newsletter. We welcome new librarian, Matthew Pastula, to our team. 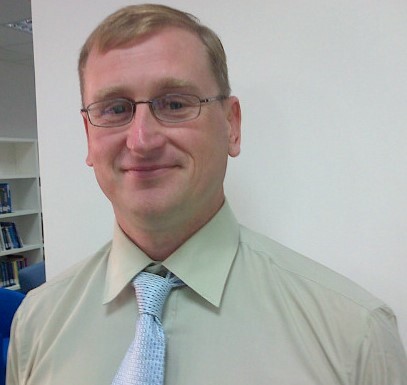 He will be the ILC- Library Coordinator at the Khalifa bin Zayed Air College Library in Al Ain. 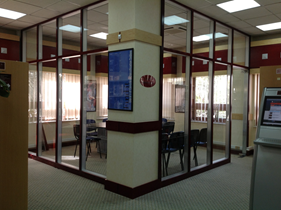 The Library now has a new Meeting Room. The room is located in between the bookshelves. It can be booked by faculty, staff and students. Read the What's New page for information on how to book the various Library and ILC spaces. This month we focus on, Shalina Nazar, the Library Technician on the Faces page. She describes her beautiful Kerala in India, and how having books available from a young age influenced her decision to study Librarianship. The Libtoon on the Library Navigator page gives a step-by-step tutorial on how to request resources from other HCT campuses. This inter campus loan system exists between all the HCT campuses, as well as with Zayed University and the University of the United Arab Emirates (UAEU). Browse through our new and existing library Dazzling Databases. We focus on Taylor and Francis eBooks Online and Britannica Online. The entire database collection can be accessed day or night; whenever and wherever you need it. If you need assistance, the ADMC Librarians Stephen Visagie and Louise Sikkens, are an email or a phone call away. Take a look at Stephen Visagie's engineering guides on the LibGuide/CampusGuide page. Stephen is the liaison librarian to the Engineering Department. His guides are a great resource for guiding your research. Last but not least, congratulations to all graduating students! The Library welcomes the Math and Physics Support Center into the room currently known as ALZ 2. Staff from the Physics and Mathematics Departments will take turns in the MPSC to assist students needing extra help with physics and mathematics. Elizabeth Rainey will continue assisting students with English in ALZ 1. Browse over to our Faces pages to find out more about our Associate Dean: Library, Learning Centre and Special Needs, Suzanne Poulter. On the LibGuide/CampusGuide page, Geetha Ramesh explains the process of requesting and evaluating trial databases prior to system-wide purchase. The Libtoon on the Library Navigator page answers the question "How to recommend a purchase for the library". This easy step-by-step guide makes recommending a book, journal or DVD very easy. Make sure to register for as many Library Professional Development sessions as you can during PD Week! They range in topic from Weeding the Library's Collection; how to create Blitzing Bibliographies; to using Google Scholar for your research. 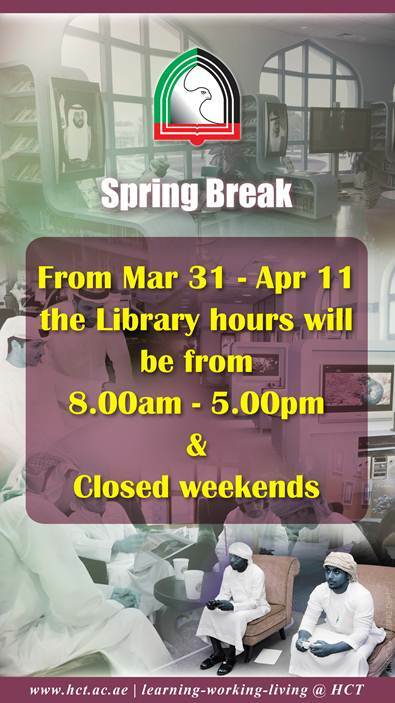 And finally, please note that Library opening hours have been adjusted for the Spring Break - see below.